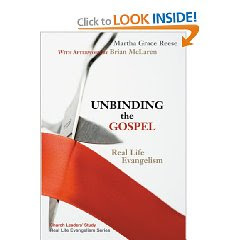 I recently picked up a book called Unbinding the Gospel by Martha Grace Reese who, among other professions, has been a Congregational pastor. Unbinding is about evangelism, or the "e-word" as she calls it, but it's not your run-of-the-mill evangelical approach to evangelism. It is written entirely from a mainline perspective (mainline churches include UCC, United Methodist, and some Presbyterian, among others). Evangelical approaches to evangelism are rarely translatable into a mainline environment and they are rarely sensitive to the concerns and theological presuppositions of mainline Christians and yet the mainline church is so disparately in need of a renewed appreciation for evangelism which has basically been hijacked by conservatives and the "fire and brimstone" preachers of the world. This book is a step toward that renewed appreciation. You don't have to be a conservative-evangelical to think that faith matters and that evangelism is important. Reese writes, "when we know why it matters to be a Christian, we'll figure out how to help other people enter the faith" (page 18). Whereas the vast majority of evangelical approaches start and finish with a presupposed doctrine of hell, Reese knows full well that hell is just not a shared essential doctrine in the mainline church. She reminds us that hell is not the only reason for evangelism, in fact there are plenty of good reasons to share our faith even if you don't believe in hell (this is just not typical of any evangelism book I have ever read). Reese writes "The theology most mainline pastors preach is grace-filled. Where that grace is supported by a vivid sense of relationship with Christ, it is real and rich. THIS is what we share!... churches of all theologies can do exciting, effective evangelism" (page 18). I have talked for a long time about how evangelism has been hijacked by televangelists and people like Ray Comfort. I have said for a long time that we shouldn't give up on it just because people have given it a bad name but instead we should take back evangelism. We have some really good news to share, news about the best kind of life and about God's great vision for this world. This book provides a perspective that can empower people of a plurality of theological backgrounds to get back to the heart of evangelism and to learn anew what it means to share the gospel of Jesus Christ.